44.5 x 96.5 x 167.6 cm (17 ½” x 38” x 66”) Brooklyn Museum. It is my fervent hope for peace in the Middle East. In that interest, I’m introducing you to an artist who expressed the same hopes of his fellow South Africans for their country during the end of Apartheid. Apartheid was the separation of native Africans of South Africa by the Dutch and British colonists, starting in 1948. Segogela’s piece celebrates the hope native Africans had about democratic changes to South Africa that began in 1990 and anticipated the democratic elections in 1994, in which Nelson Mandela was elected president. Segogela is a self-taught artist born in Sekhukhuneland in western Transvaal, home of the Marota (Pedi) culture. He was trained as a woodworker. His membership in the anti-Apartheid group ANC (African National Congress) and his conversion to fundamentalist Christianity in the Church of the Five Missions have inspired his work. The aim of his subject matter is to rid the world of violence and hate. Segogela’s spirituality is obvious in this piece in which clergy waving Bibles exhort South Africans to get rid of their guns in the device in the background. 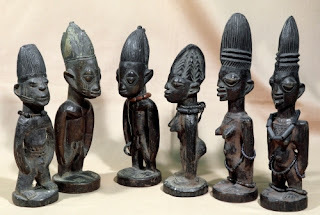 Stylistically the piece recalls African figure sculpture from the entire continent throughout the centuries, although the figures are less abstracted. 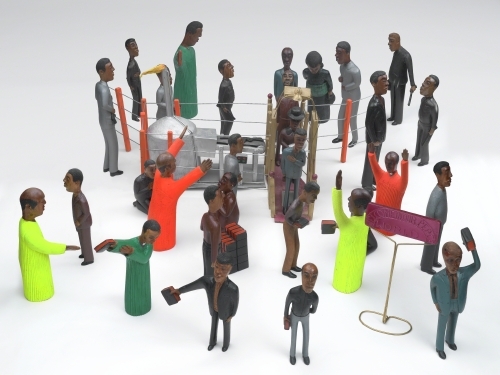 Segogela wants to express his feelings about religion, politics and the evolving South African culture post-Apartheid. As a work of art, it has a stronger thematic emphasis than stylistic. In a wider context, Segogela’s work points out an aspect of African sculpture that has been present since the most ancient of African periods, Ancient Egypt: the sculpture is invested with spiritual intent and power. In the following works from ancient Egypt and Nigeria, we see the spiritual function these sculptures served. 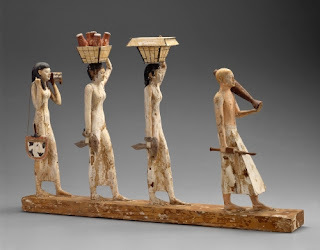 In the case of the ancient Egyptian offering bearers, the figures represent a presence (through a physical object) of the connection of servants to their deceased masters in the afterlife, providing eternal service from the tomb. The Ibeji figures from Nigeria represent monuments to one of two deceased twins who will represent that twin in the physical world forever.